Sedum are uncommonly fresh and healthy all season long. Even out of bloom, the succulent foliage is luscious and vibrant. Commonly known as Stonecrop, Sedum is a large genus with varieties from low growing to tall. Foliage is dense and succulent, meaning the leaves are thickened and fleshy to retain water, so the plant is very drought tolerant and the high water content gives Sedum its’ always healthy look. Stonecrop is known for its large dense flower heads that bloom from summer into late fall, as well as its colorful foliage. The leaves are generally a smoky blue in summer and shades of burgundy in the fall. They prefer full sun and a well drained soil as Sedum is susceptible to fungal disease in wet humd summers. When grown in overly fertile soil the plant may not be as strong and tend to flop over. This is a very easy to grow and care for perennial. 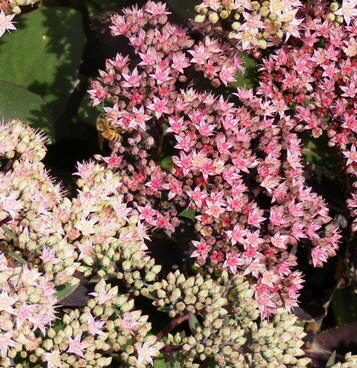 Sedum are a favorite plant of butterflies and bees. Soil Requirements: Average well drained. Not fussy about pH. Foliage: Fleshy oblong gray-green leaves that may vary from blue green to yellow green. Fertilize: Top dress lightly with compost each spring or apply a balanced fertilizer. Do not over fertilize. Maintenance: Mulch to retain soil moisture. Divide every 3 to 4 years in early spring when growth begins. Other: Attracts butterflies, deer resistant. Moderately salt tolerant and highly tolerant of urban pollution. 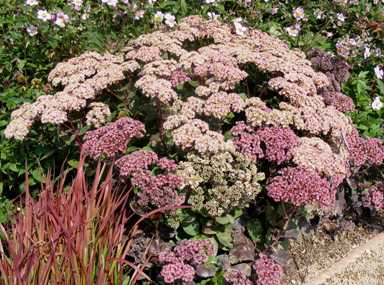 ‘Autumn Joy’ Sedum is a garden classic, and the most popular of the Stonecrops. Green broccoli like heads of buds form in summer, exploding into a large flat flower head of pink blooms in August. The large flower heads are supported by strong sturdy stems. By fall the petals mature to a deep rusty red. Healthy foliage is attractive early in the season, offering texture and substance, and a soft green contrast to brighter plants. Spent blooms may be cut back to freshen the plant, but allowing them to over winter will add interest to the winter garden and attract birds for the seeds. Sedums are not heavy feeders, a light application of compost or balanced fertilizer is generally plenty. Once established, Stonecrop requires very little attention and is very drought tolerant, holding up well in heat and humidity. A reliable and mostly trouble free perennial, ‘Autumn Joy’ is tolerant of clay soils if they don’t get too wet and not bothered with any serious insect or disease problems. The dried flower heads are perfect for arrangements. The colorful fall blooms can add a great accent to your sunny border or container garden. These heat and drought tolerant succulents are a perfect border to hot walkways and driveways. Due to continual name changing, you may find ‘Autumn Joy’ sold as Sedum spectabile or Hylotelephium spectabile (this relates to ‘Autumn Joy’s’ parentage). ‘Black Jack’ has such a deep purple foliage color it appears to be nearly black. The leaves first emerge light green with purple undertones, but quickly darkens to deep purple. Best color is achieved in full sun, minimal watering, and average to poor soil that is not over fertilized. The growth form tends to be more upright and a bit less spreading than most Stonecrop. The leaves are thick and broad on strong upright stems. The bloom heads are enormous and can reach up to 8 inches across. The flowerheads develop beginning in July and burst into bright pink blooms in September. The pink contrast to the purple foliage is spectacular. Grow in full sun to keep the stems strong and avoid flopping over, but in intense sun of the hotter regions the color may not be as deep and leaves may scorch without light afternoon shade. ‘Maestro’ may be a better selection for hot regions if you cannot provide afternoon shade, although the foliage color is not as deep. The flower heads will dry to a lovely rust color going into winter. ‘Black Jack’ is stunning when paired with a red ornamental grass such as Japanese Blood Grass. ‘Garnet Brocade’s’ foliage opens blue green and matures to burgundy by late fall with red-purple stems. Best leaf color is achieved in full sun. Pink buds open to pink flowers that mature to a burgundy rose. ‘Garnet Brocade’ is a relatively tall Sedum in cool Midwest regions, you may prefer to pinch back the stems when they reach about 6-8”. The plant will not grow quite as tall in warmer regions. This will increase branching and reduce height, but will also delay blooming slightly. Plant ‘Garnet Brocade’ where the varying shading of the blooms and foliage can be appreciated. Very nice in groups in the sunny border or rock garden. ‘Garnet Brocade’ may also be marketed as ‘Garbro’. 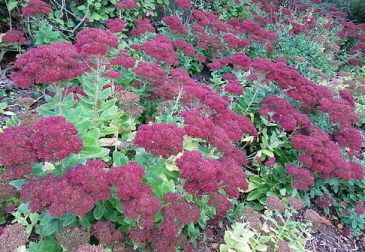 ‘Ruby Glow’ is a low growing Sedum that forms a spreading clump. Deep red stems bear purple tinged leaves. The full bloom heads begin forming in May and open to deep crimson flowers in August. ‘Ruby Glow’ is a great low growing perennial for rock gardens, containers or any hot dry border garden. Creates an excellent border edging along hot driveways and walkways. Stunning when grown with pink blooming plants. May also be marketed as ‘Rosey Glow’.